The first of the lop rabbits, the English is essentially an exhibition breed and is not a very common pet rabbit. Crosses with continental giant breeds led to the development of the French Lop and from the French came other breeds such as the Dwarf lop. The English Lop is very distinctive with incredibly long lop ears, bold head and large body size. The rabbit can weigh around 11lbs (5.5kg). On November 1, 2003 the ears of an English Lop called Nipper\'s Geronimo were measured at 79 cm (31.125 in) in a complete span at the American Rabbit Breeders Association National Show in Wichita, Kansas, USA and are recorded as a Guinness World Record. 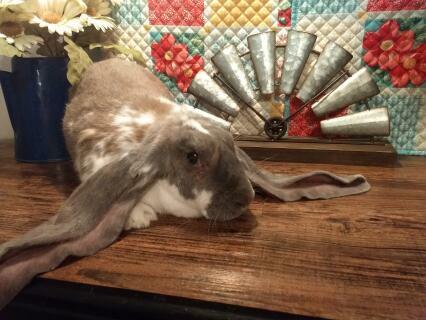 The English lop needs an experienced owner and lots of space. They are often quite placid and friendly animals but could become fearful if handled badly. They require a large living area to prevent them from treading on their own ears. Black, fawn, white, golden fawn, sooty fawn or marked. Our English Lop loves being near people, he will follow you around, watch what you are doing. My daughter can get him into the hutch with a few taps on the floor and he will hop over to see what she is doing. If you are busy in the garden and not giving him any attention he will nudge your ankles to remind you he is around!